Born at New Hampton, New Hampshire, April 10, 1807, at age 19 he moved to Wheeling, in what is now West Virginia, in 1851 and became a freight agent of the Baltimore and Ohio Railroad line. In May 1861 he raised the 1st West Virginia Volunteer Infantry,a 90-day regiment which he led at the Battle of Philippi on June 3. In the first year of the Civil War, "loyal" regiments recruited in the Western Virginia area were called the 1st Virginia, etc. After Congress admitted West Virginia as a State in 1862, the names were changed to West Virginia regiments. He was severely wounded in his first engagement and upon recovery was commissioned Brigadier General to rank from may 17. Virtually all of his war duty took place in West Virginia and Maryland, where his principal duty was to guard the lines of the railroads in the area. He took part in the pursuit of the Army of Northern Virginia following the Battle of Gettysburg, the dispersal of Imboden's camp near Moorefield in November 1863 and in the engagements at Cumberland, Maryland and Moorefield and New Creek, West Virginia, in 1864. On February 1, 1865, a band of Confederate Rangers made a raid on Cumberland and carried off both he and Major General George Crook, his superior in command of the Department of West Virginia. Both were at the time engaged to belles of the town, to whom they subsequently married, and the affair created a contemporary furor which has been ignored by biographers of both men. After briefly being held prisoner in Richmond, they were relased by special exchange. He was breveted Major General August 5, 1864 and on July 1, 1865 he resigned from the Army. During the remainder of his life he held successive Federal positions as a reward for his war services. President Grant made him Collector of Internal Revenue for West Virginia in 1866 and he served as Commissioner of the Hot Springs, Arkansas, Military Reservation ten years later. In 1883, President Chester A. Arthur appointed him Examiner of Pensions. 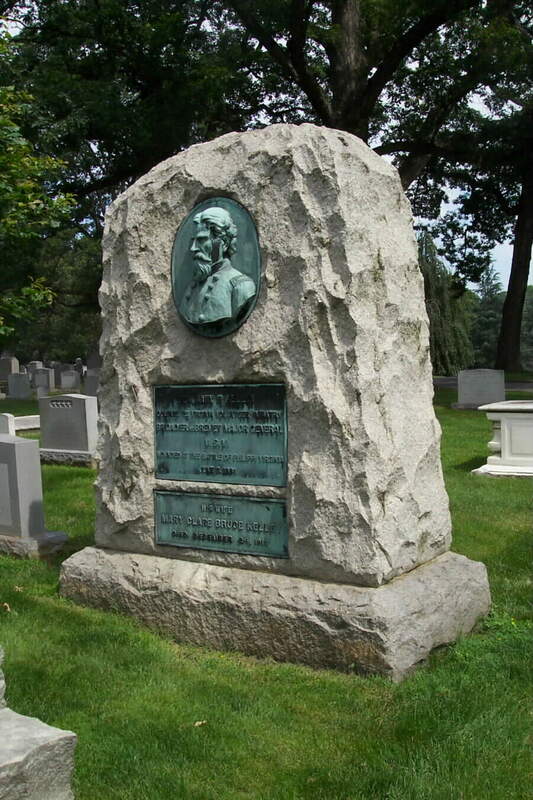 He died at Oakland, Maryland, July 16, 1891 and he was buried in Section 1 of Arlington National Cemetery, where the large statue onthe gravesite of his Aide-de-Camp, Lietuenant Thomas Hudson Mckee, blocks the view of his portrait on his own private memorial. His wife, Mary Clare Bruce Kelley, who died on December 24, 1910, is buried with him. brigadier-general of volunteers, 17 Nay, 1861, captured Romney on 26 October, and was again victorious at Blue's Gap. 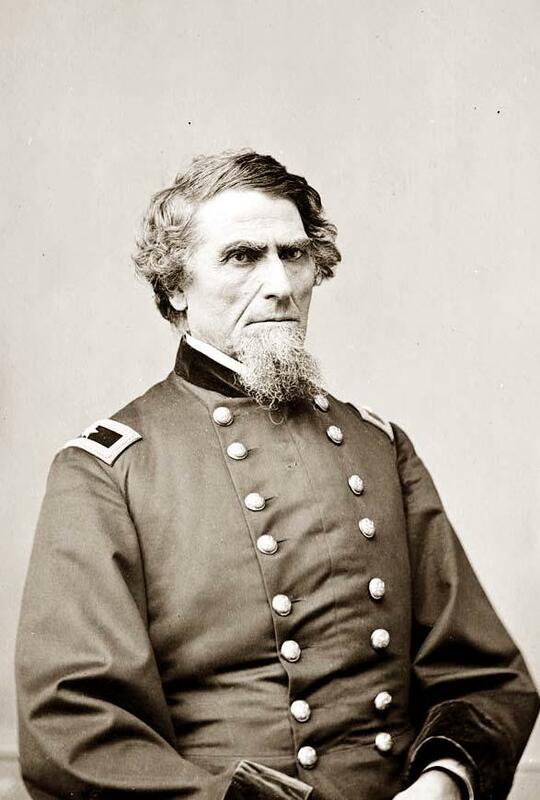 He was then given the command of the Department of Harper's Ferry and Cumberland, but was relieved at his own request, in consequence of his wounds, in January, 1862. In the following summer he resumed command of the railroad district under General John C. Fremont, and in July, 1863, he was assigned to the Department of West Virginia. He was engaged in the pursuit of Lee after his passage of the Potomac, and in November, 1863, destroyed the camp of the Confederates under General John D. Imboden, near Morefield, Virginia In August, 1864, he repulsed the Confederate forces at Cumberland, Maryland, New Creek, and Morefield, Virginia, and on 13 March, 1865, he was brevetted major-general of volunteers. At the close of the civil war he was appointed collector of internal revenue for the 1st district of West Virginia, in 1876 became superintendent of Hot Springs reservation, Arkansas, and since 1883 has been examiner of pensions. Benjamin F. Kelley was the first Colonel. Mention being made of his service and wounds, we have here to add that he was nominated by President Lincoln to be a Brigadier General of volunteers at the same time at which General Grant and a number of others who became illustrious in the War of the Rebellion were named for like positions. 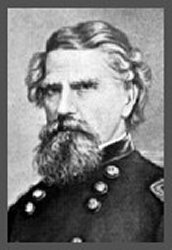 General Kelley was confirmed by the Senate and as a brigadier-general he commanded many important armies during the progress of the war. 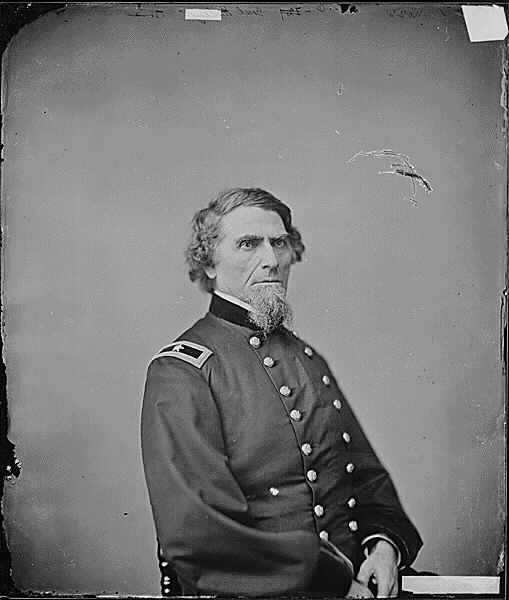 He was the only Brigadier General that ever commanded a department as such, through the entire war, notably the Department of West Virginia in the summer of 1864. He was brevetted major-general and leaves a record for fidelity and devotion to the cause of the Union, sharing in the establishment of a new State -West Virginia. 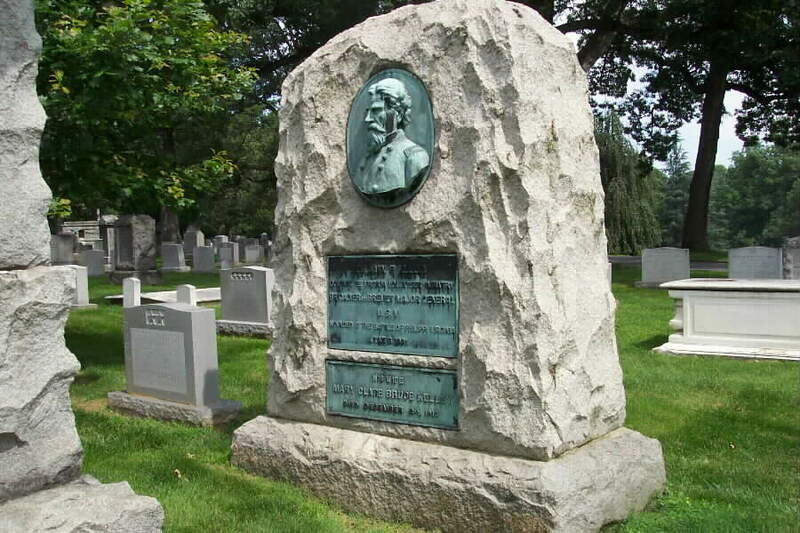 He now sleeps among more than 14,000 of his comrades at Arlington, where future citizens shall view his resting place and talk of his life service in the cause of liberty. CUMBERLAND, Maryland, July 18, 1891 – At the request of Crook Post, G.A.R., of Oakland, the remains of Major General B. F. Kelley were taken to Oakland this afternoon and placed in St. Matthew’s Episcopal Church, where they will lay in state until Sunday morning at 9:30 o’clock, when the funeral services will be conducted by the Rev. S. F. Hipkins, pastor of the church. 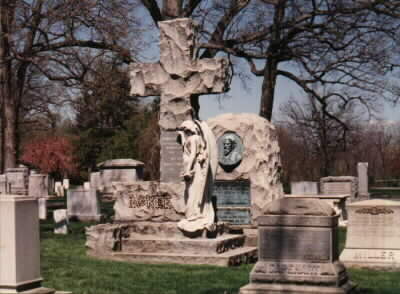 The large monument with the cross and the female figure is that of Lieutenant Thomas Hudson McKee, who served under General Kelley. 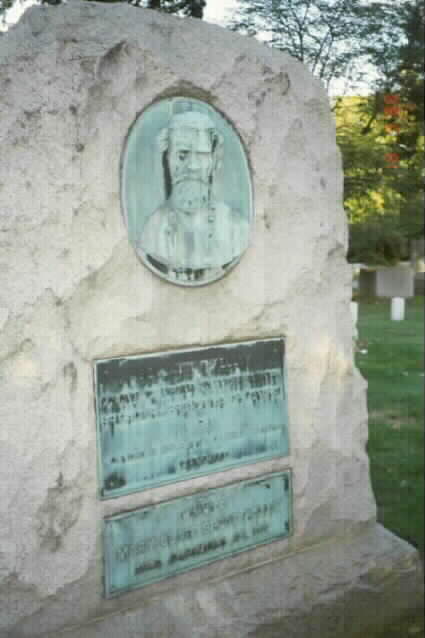 Kelley's monument, with his likeness on the front, is direct behind that of McKee's.